Don't stay away! The Murray is looking fantastic in 2018! Help out the Murray River communities and businesses by coming to our region and enjoying a holiday with us. Please don't stay away as we're open for business. All locks and weirs are currently open to our knowledge. Some Government departments do not contact us regarding possible maintenance or other issues regularly. 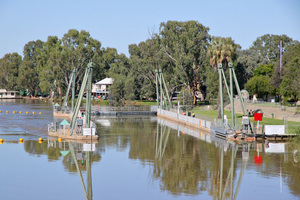 On behalf of the Murray Darling Basin Authority, SA Water are undertaking extensive essential maintenance on Lock 3 at Overland Corner. The lock chamber will undergo a complete refurbishment which is vital to the longevity of the structure. During this period, vessels will be unable to navigate through Lock 3 for approximately 12 to 14 weeks from 12 June 2018, and public access to the Lock grounds will be restricted. We apologise for any inconvenience and appreciate your cooperation while this important work is undertaken. 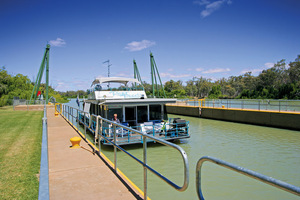 For further information please call Lock 3 on (08) 8588 7005 or River Murray Operations Berri office on (08) 8595 2222. Boat Operators are advised that due to essential maintenance, there will be a temporary restriction to navigating vessels between Lake Alexandrina and the Coorong through the Tauwitchere Barrage Lock. On behalf of the Murray Darling Basin Authority, SA Water is undertaking essential maintenance on the Tauwitchere Barrage Lock chamber. During this period, vessels will be unable to navigate through the Tauwitchere Barrage Lock (from Lake Alexandrina to the Coorong) from 30th July to 7 September 2018. Vessel Operators are reminded the Goolwa Lock will continue to operate as normal. For information please call Goolwa Office on (08) 8555 2046 or River Murray Operations Berri office on (08) 8595 2222. SA Water PDF fact sheet about travelling through a lock - Travelling Through a Lock (PDF) or click here. Other Lock chambers Upstream of Lock 9 are under the control of other authorities, State Water NSW and Murray Goulburn Water Victoria. Mosquito numbers have increased on the Murray River. Protect yourself with tropical strength repellent. STAY SAFE: Safe swimming in the Murray River.